Wheat allergy is an abnormal immune system response to one or more of the four proteins found in wheat, including albumin, globulin, gliadin and gluten. Wheat allergy is most commonly seen in children, especially those with an immature immune or digestive system, and is usually outgrown before reaching adulthood. 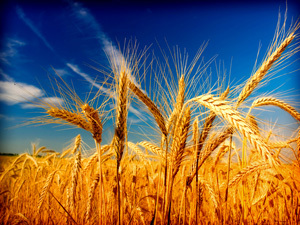 Additionally, individuals with a family history are at an increased risk for an allergy to wheat. Wheat allergy is sometimes confused with celiac disease, which is a digestive disorder that creates an adverse reaction to the gluten found in wheat, rye and barley. Don’t assume that you have celiac disease unless a diagnosis has been confirmed by your doctor. Skin test – A skin prick is used to expose small amounts of the protein to your body. A food allergy is confirmed by the presence of a raised bump or hive at the prick location. Blood test – A blood test, also referred to as an IgE test, measures your immune system’s response to the proteins found in soy by counting the number of specific antibodies in your blood. Food diary: You are asked to maintain a detailed record of everything you eat, noting if symptoms are experienced. Elimination diet: The offending food is eliminated from the diet. Then, under the direction of your doctor or a registered dietitian, you will gradually add these foods back into your diet and note if/when symptoms return. Food challenge testing: Following ingestion of gradually increased amounts of the suspected food allergen, you undergo careful supervision for a few hours or days to determine if any allergy symptoms occur. Eating Out: Always take extra precaution when dining in restaurants or eating foods prepared by others. Order simple dishes prepared with fresh foods. Avoid foods that may have hidden sources of wheat proteins, such as sauces that often have multiple ingredients or deep-fried foods that may be cooked with other foods containing wheat. When in doubt about any product or dish, don’t eat it. Be sure to ask detailed questions about ingredients and how the food was prepared – your health and safety are at stake! A new diagnosis can be scary. Be sure to build a support of family, friends and healthcare professionals to help you manage your wheat allergy. Talk to a doctor or dietitian when eliminating these foods from your diet. They may recommend an adjustment in your meal plan or a supplement to replace nutrients lost by eliminating the offending food and food ingredients. Also talk to your doctor about how to prepare for a reaction. You may treat a mild reaction with oral antihistamines to reduce signs and symptoms and relieve discomfort. If you are at risk for severe reactions or anaphylaxis, your doctor may advise you to wear a medical alert bracelet and/or prescribe an injectable epinephren (EpiPen) to carry with you at all times.